Orthopaedic Specialists PLLC was awarded the 2017 Louisville Business of the Year Award by Business First at a special event held at the Seelbach Hilton on December 5, 2017. Over 300 attendees filled the Seelbach ballroom in downtown Louisville to recognize the achievements of 19 Louisville-area businesses and organizations. Businesses and organizations of varying sizes and across industries were recognized in six different categories: Very Large, Large, Medium, Small, Emerging, Non-Profit. 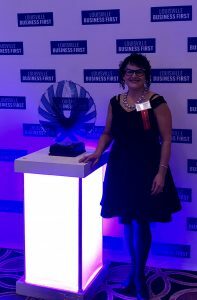 Louisville orthopedic surgeon, sports medicine doctor, and business owner Dr. Stacie Grossfeld was in attendance to accept the Louisville 2017 Business of the Year Award for the “Small Business” category on behalf of Orthopaedic Specialists PLLC. This Business First program has been recognizing Louisville-area businesses since 2005, identifying top companies that demonstrate growth, innovation and excellent leadership. 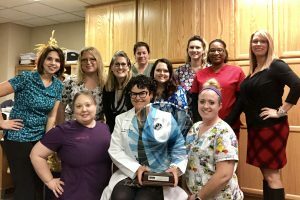 In receiving the award, Dr. Grossfeld recognized all of the contributions various members of the Orthopaedic Specialists PLLC team contribute each and every day which made an award like this possible. This year’s event sponsors included: Stites & Harbison PLLC; Stock Yards Bank & Trust Co.; WHAS-TV, Bulleit Frontier Whiskey Experience at Stitzel-Weller and Nanz & Kraft Florists. Along with business awards, the Excellence in Leadership award was given to Gill Holland for the work he is currently doing to redevelop Louisville’s Portland neighborhood. Louisville Business First is part of American City Business Journals (www.acbj.com) and is led by Market President and Publisher Gary Tyler.